It was time to head north toward the Honduran border, and learn about life in the campo along the way. 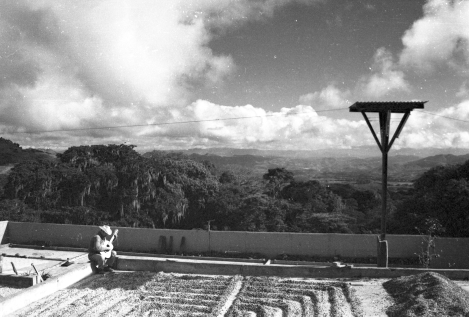 During this period, and perhaps sometimes in subgroups, we visited Esteli; Condega; Pueblo Nuevo; Palacaguina; a government project named after the Nicarguan patriot—and assuredly poet as well—Rigoberto Lopez Pérez, and the coffee cooperative El Chaguiton. Ricardo was not a great fan of the Sandinistas, but he told us that they were practical, and not committed to anything like the "communist model" that Washington accused them of. Ricardo said that many of the nation's buses were being sold to private entrepreneurs, and that the Hotel Descapa was being built by the state but would be turned over to the company that ran the Intercontinental. He said that the state provided scholarships to the tourism school, so Nicaragua could tap into the increasing market for south-of-the-border R&R. 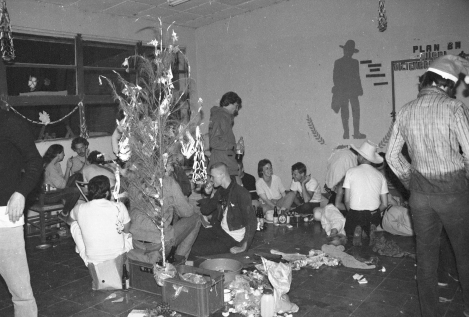 Ricardo also said that, at least in Esteli, there was no Eastern Bloc presence. His final comment was that the U.S. was "in error" with its contra program. We also visited Condega and Palacaguina on the 21st. With the people of Palacaguina we sang Cristo de Palacaguina, one of my very favorite songs. I have it on Sabiá's famous Green Tape, the first of their several popular recordings of Nuevo Canción. The people of Palacaguina then sang the Sandinista anthem, with great pride as always. 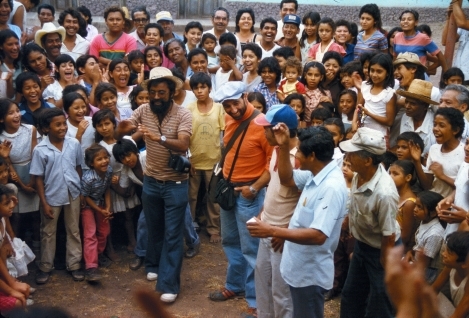 Our next stop was the Rigoberto Lopez Pérez project, made up of about three hundred very militant workers and soldiers. My notes don't show what the project was about, so I welcome any information that a visitor to this site might be able to supply. My notes show the 22nd as a day of rest and washing, but it also seems that I went along on a rather bumpy ride in the back of a flatbed truck, accompanied by about 15 soldiers, to Pueblo Nuevo. Here, in small, personal meetings with the Mothers of the Heroes and Martyrs, the FSLN representatives expressed their support, and their understanding of how difficult it was for these women to celebrate Christmas without their sons and daughters. These sentiments were expressed with a great measure of pride, dignity, and gentleness. 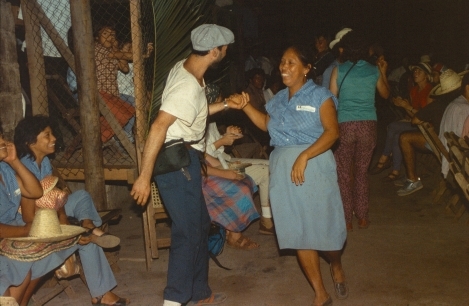 Later, the mothers said to us: "We may suffer, but we know how to celebrate—the mothers invite you to dance." And, so we did. There was also spontaneous singing by all in the park as we waited for the trucks to take us back, on the same bumpy road, to Esteli. Some day of rest! December, 2010. This, and the next two photos are of Phil Otis, who was an important member of the documentary film team. Phil died recently, and Kent Strumpel, who took these pictures, has given me permission to post them in his memory. I have placed them at the front of this page because it seems to be about the right time frame. Because the film crew travelled futher afield than the main body of the march did, I did not get to know Phil well; but I do remember a few pleasant conversations with him. Kent thinks that here Phil and a Dane(?) named Lief are in Puebla, Mexico. 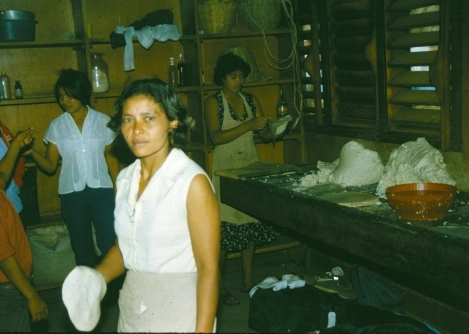 The quality of the shop and its offerings are atypical of Nicaragua. 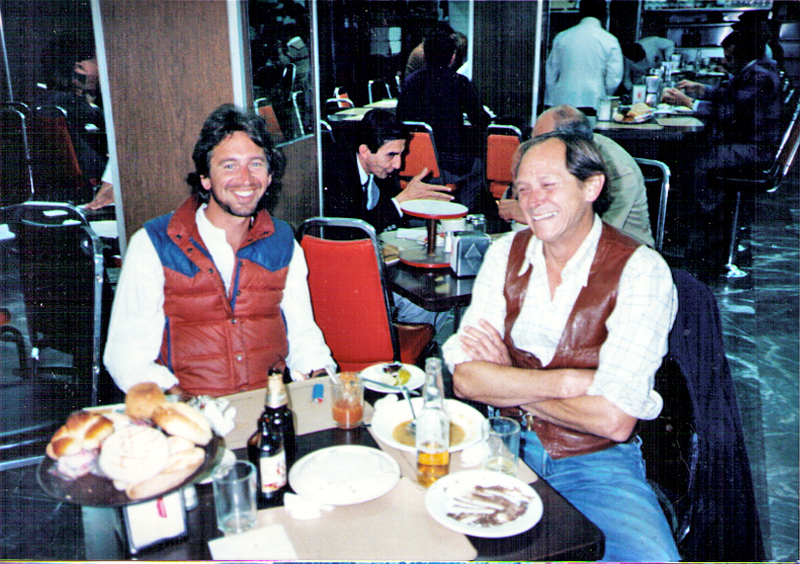 Here Gary Meyer, another film crew member, and Phil sit at a restaurant, probably Mexico City. 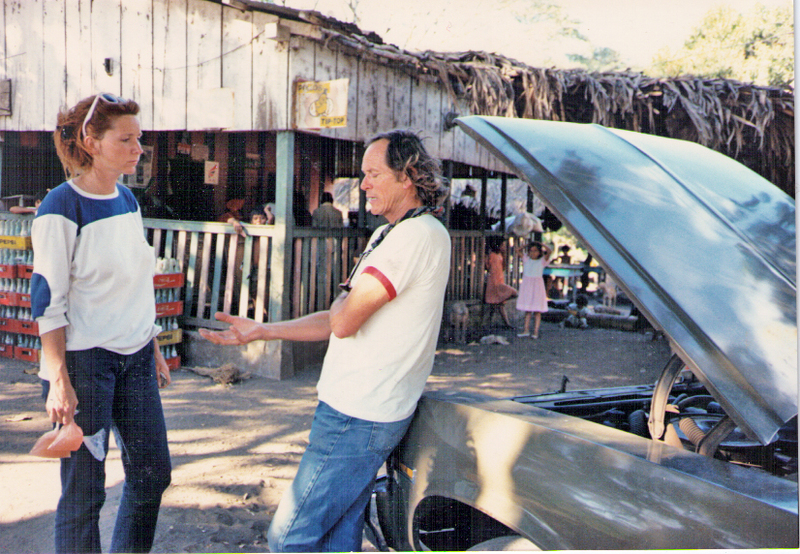 The film crew's taxi broke down on the way to the Nicaraguan port town of Potosí, on the gulf between Nicaragua and El Salvador. 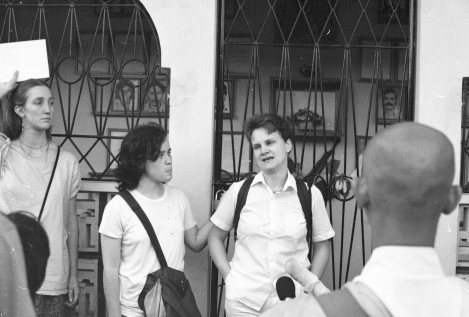 They wanted to get footage of the Salvadoran peace activists who still hoped to meet us, even though the Salvadoran government said that we could not enter. The idea was to cross the gulf in boats, and somehow rely on international pressure to allow the filming to proceed. The plan was not realized, and I am sure that the crew would not be here today had they succeeded in landing on El Salvador's shore. Here, Phil tells Kelly Holland that he can fix the taxi for two cases of beer, but she will have to throw in the blended goldfish as well. Kelly was the director of the documentary, Viva La Paz, and did heroic work putting it all together. Here we are given an enthusiastic welcome by members of the El Chaguiton coffee cooperative. I have no specific reference to just where El Chaguiton was located, but, consistent with my notes as to our itinerary, Blase Bonpane is pretty sure that it was near Condega. So far as I have been able to determine, El Chaguiton no longer exists; at least under that name. We will spend a night here, and try to get some feel for what it means to try to earn an honest living while under mortal attack. Just after this photo was taken, a pig was slaughtered for our dinner. During the march, I pretty much abandoned my vegetarian diet and became an omnivore. we discussed what to do about one of our leaders, whose strongly militant attitude and presumption that he was the public spokesman for the entire march had offended most of us. A proposal that he step down from his official position carried, 22 to 4, but my notes don't show the actual outcome of this controversy. My notes say that we were supposed to pick coffee while at El Chaguiton, but that most all the pickers were on Christmas vacation so there was no one to teach us. 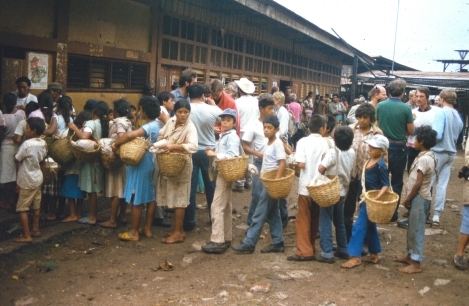 Here, those who stayed behind line up to receive their lunches for a day picking the coffee. 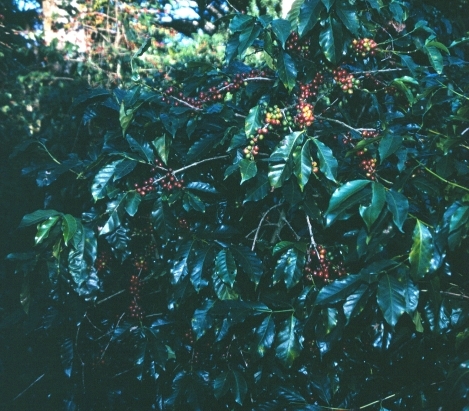 A coffee plant with berries ready for harvest. Very pretty. It looks as if the berries mature at different rates, and that pickers will revisit the same plant several times. My guess is that the reddest berries are the ones that will go into the basket. These coffee bushes grow in the shade of the tropical "canopy," the destination for perhaps the majority of North America's migratory songbirds. The huge demand for designer coffees in the U.S. and Europe led to serious destruction of these forested areas so as to grow more coffee on cleared, sun-drenched hillsides—and using more pesticides and fertilizers as well, of course. Along with increased polluted run-off into the streams, enough of the canopy was destroyed as to foreshadow a serious reduction in songbird populations. The resulting outcry led to some progress made by such marketing giants as Starbucks toward preserving the canopy. The Fair Trade coffee movement adds this environmental ethos to its primary comittment to return more of the retail price of the coffee to the pickers themselves. 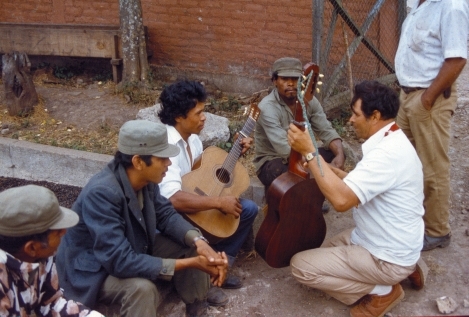 Here California farm worker Francisco discusses guitar theory with some of El Chaguiton's musicians. Guitars were everywhere in Nicaragua, and on la marcha, too. A wider view of the same scene. If I recall correctly, the first step in processing coffee after picking is to soak and wash the beans. 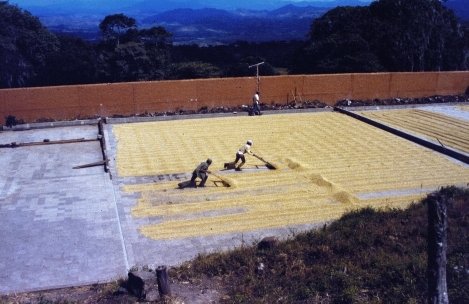 Then they are spread in rows on the concrete to dry. I think the hulls, which have been somewhat separated from the bean by soaking, give the rows their dark color here. 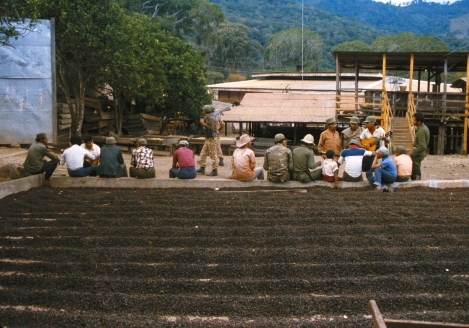 Here we see workers, one of the cooperative's children, and soldiers together. Two soldiers walk by to the left, with their Russian-made AK-47s over their shoulders. Here, if I'm not mistaken, the hulls have been stripped from the beans, which are regularly turned over until they are ready for roasting. I don't recall the odor of roasting coffee here at El Chaguiton, so that process might well have taken place in a more central location. I'm not really sure where we are here. 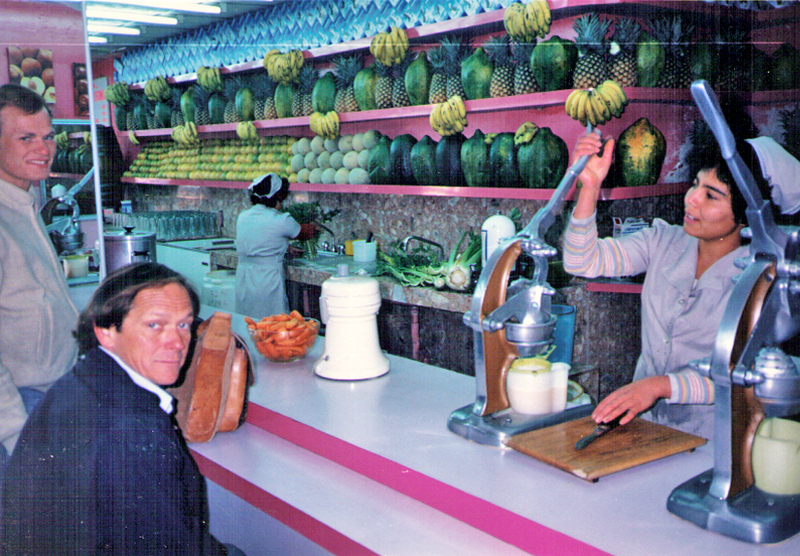 The posters indicate that we might be at the Rigoberto Lopez Pérez enterprise. 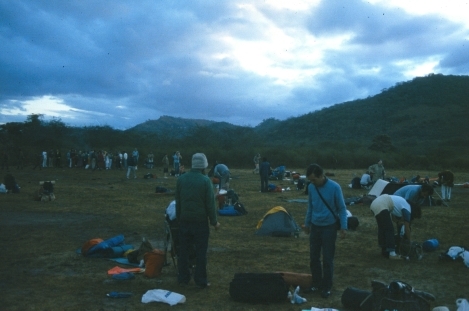 Others of my photos indicate that we may be lining up to receive blankets and pillows for a night's stay, but my notes don't indicate that we spent the night at Rigoberto Pérez. A serious professional failure, redeemed only by the fact that we were indeed here, and here the spirit of the revolution was expressed perfectly. Australia's Penny O'Donnell mugs for the camera, while Scotland's Paul Baker, standing just behind Penny, inspects what may well be a patriotic flyer tacked to the bulletin board. So you want another tortilla? Soldiers leave for a day on patrol. 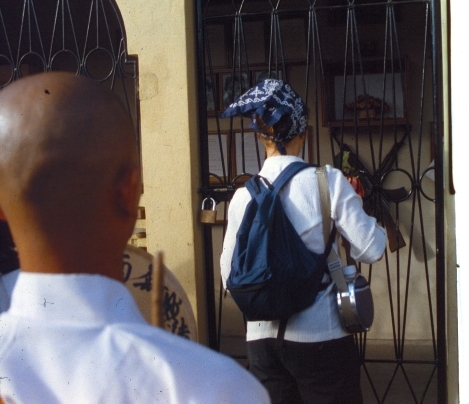 There was no action in the neighborhood while we were at El Chaguiton, possibly because of our presence there. 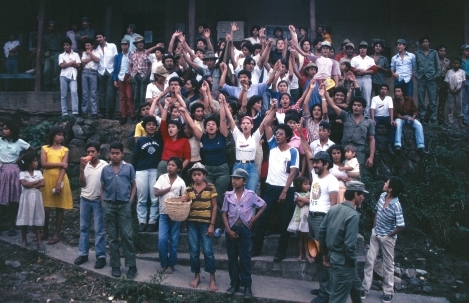 In 1983, the ecumenical group Witness for Peace was formed to send North American volunteers to live in combat area villages, on the theory—correct as it turned out—that Reagan and his operational henchman, National Security Council minion Lt. Col. Oliver North, would restrain the contras from attacking any village where such Americans might be killed. By "such Americans" I mean those who were there in a capacity that could not possibly be interpreted as being officially pro-Sandinista. WFP volunteers were strictly non-violent, and also provided Congress with devastating documentation of contra atrocities. 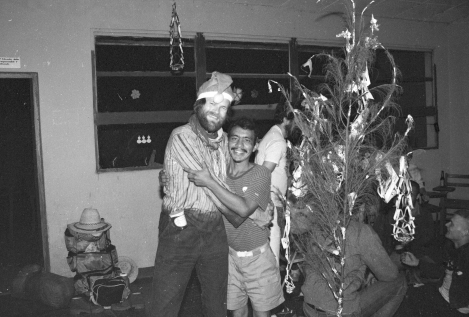 On the other hand, American Ben Linder was killed by contras in a village where he was advising the Sandinistas on the construction of a new water system. Even this was probably a mistake, but it is also doubtful that the news of Linder's murder clouded President Reagan's sunny dispostition in the least. I'm not sure that this photo belongs here. It is night, past the time of the dancing and singing I mention above. In any case, here Marshall and a Nicaraguan woman enjoy each other's company on a dance floor somewhere. This could be Pueblo Nuevo—I don't know. Here Marshall assists one of our Spanish marchistas (I think) in entertaining the townspeople with some magic tricks. Look at the genuinely happy and even radiant expressions on the faces of these people who were suffering such terrible atrocities at the hands of President Reagan's assassins. Again, it is painful for me to revisit pictures like this. We're back in Esteli, at the Escuela Normal Roman Esteban Toledo. There was a Mass, fireworks, gunfire (typical in any heavily-armed society), a turkey dinner. Later, of course, the Danes had their own party, which I was pleased to attend. An expression of genuine solidarity and friendship transcending all culture and language. 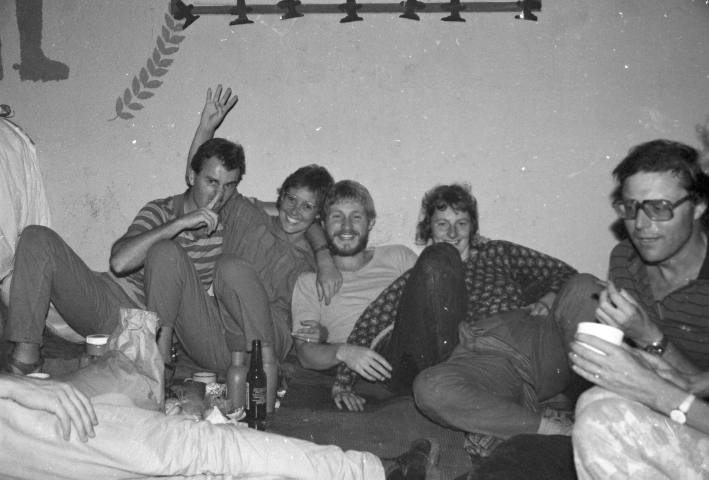 Thanks to Jim Staal for identifying Martin Breum, Hanne Seln?s, and Kim Hundevadt with the beard. Sonja Iskov reclines to Kim's left. The man in the glasses on the right is unidentified. I don't show any activity for Christmas day, much beyond that I called home from the state-owned Telcor. Upon my return, my friend Mike Emery informed me that the Danes had really overdone it the night before. Indeed, Jim Staal showed me the end of his thumb—with no skin on it. His chair had tipped over and his thumb got caught between it and the concrete apron of the building where the Christmas party was held. He was in good spirits nonetheless. Thus does Viking blood still course through the veins of these eminently decent and generous people. 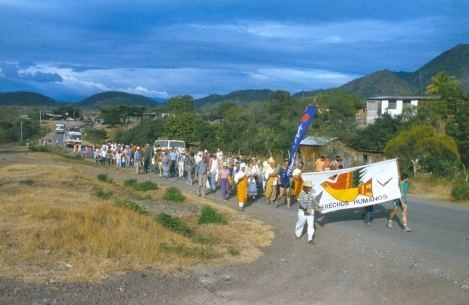 With several other marchers, Jim soon left for El Salvador as an unauthorized (by the Salvadoran government) participant in the Salvadoran leg of la marcha. Here we are at the Gallery of Heroes and Martyrs, a small shrine in Esteli commemorating the sacrifice made by all those who died in service of the revolution: soldiers; doctors; nurses; teachers; electrical workers; campesinos. It is really impossible to express the impact this small monument had on me and on the other marchistas who visited it. This American marcher, whose name I don't have, is here taking responsibility for the violence committed in her name on the people of Nicaragua. Her anguish is evident here, and even more so on the documentary. For me, the the Reagan program was monstrous in significant part just because such loving people felt that they had to take responsibility for our government's actions, when in truth it was the millions of apathetic Americans, abetted by the millions for who literally worshipped Ronald Reagan, that made this criminal war possible. We in the peace and justice movement were doing our best in that era, and need not blame ourselves for our inability to overcome what can only be seen as a deeply rooted pathology. This is probably my favorite photo. We are finally heading for the Honduran border, even though the word has come down that we will probably not be allowed to enter Honduras. 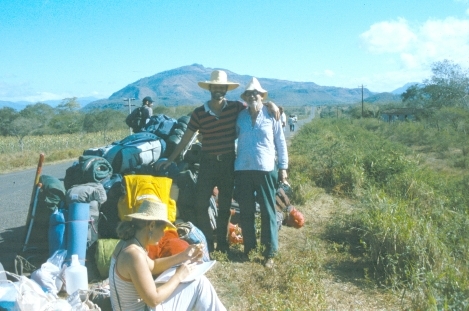 Here we are leaving Somoto on our way to a field where we will camp for the night. 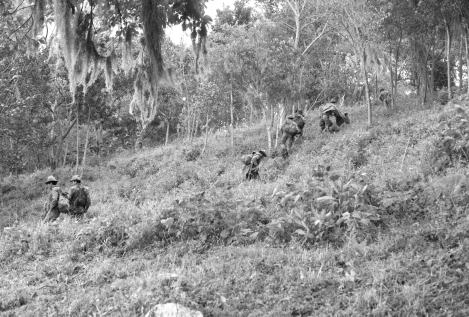 As mentioned earlier, Honduras was a wholly-owned subsidiary of the U.S. government, and made no pretense of hiding its tacit provision of land and logistical support for both small contra bases, located near the border, as well as a huge "secret" U.S. Air Force base hacked out of the jungle—also not really very far from the border. This was of course a sweet deal for the Honduran military, which was committing its share of human rights violations against Honduras's activist community. But, there was no armed insurgency in Honduras, as there was in El Salvador and Guatemala. Thus, the Honduran security forces could operate not only with impunity from the law, but with virtually complete safety as well. All that combat training at the School of the Americas was pretty much wasted on the Honduran officer corps. Nevertheless, Honduras was a member of the peace-seeking Contadora group, and so we hoped that by meeting with the Honduras peace community, we might stiffen the spine of the government, at least toward giving more than lip service to the process. 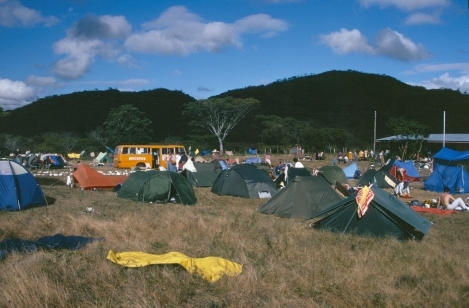 Setting up camp. Jerry from Canada is probably checking for scorpions. Here I pose with my buddy Ollie Haskell, while an unidentified marchista appears to be writing in her journal. Ollie is gone now, and I really do get a bit weepy when I think of the good times we had together on the march, and after, too. Our unexpected home for the next 6 days—Escuela Olman Flores E. Sonis (Somis? ),serving the small village of La Playa. The odds were against it, but we had hoped that we would be in Honduras this evening, meeting with our Honduran support group and learning about the human rights situation there. Que lastima—it didn't happen. 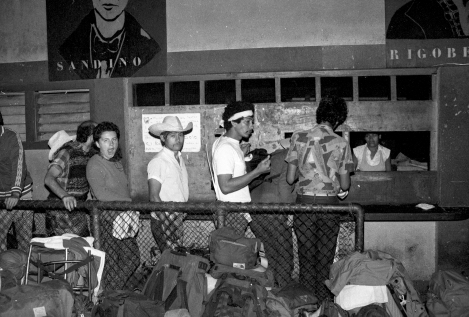 Between us and the border lies the abandoned town of El Espino, where in 1983 I gave my genuine U.S. Army-issue canteen to a Sandinista Army sergeant as my expression of solidarity with the Nicaraguan people. La Playa proper must have been somewhere else, because I don't recall any concentration of homes or shops in our neighborhood here. Beyond the schoolhouse is a very deep ravine, at the bottom of which is the river which served as our source of water for the duration of our stay here. I don't recall ever boiling my drinking water; I think I relied exclusively on my trusty iodine tablets. I also don't remember where our food and staples came from—most likely our Nicaraguan support group made the arrangements for us. I do remember giving some kids some money for a couple of pounds of rice. Took them 3 days to return with it.